The LNB is the electronics placed at the dish feed which downconverts the satellite frequencies (10,700 - 12,750MHz) to L abnd (950 - 2150MHz) which is then sent down the co-ax to the satellite reciever. The basic LNB requires a DC supply fed up the coax. This powers the internals and also selects polarisation. A 12V supply selects Vertical polarisation, an 18V supply Horizontal polarisation. Standard LNBs like the Octagon range have two local oscillator (LO) frequencies, 9.75 GHz and 10.6 GHz. The higher is selected by adding a 22kHz signal to the DC supply. For Es'Hail-2 the lower LO is used and this 22kHz tone is not required. Some newer wideband LNBs intended for SkyQ are different, so beware. The 12V or 18V LNB supply and returned signals share the same coax. A bias-T https://en.wikipedia.org/wiki/Bias_tee is needed to separate the DC from the IF but this can be very simple. Either buy one or make it using an RF choke and a DC blocking capacitor. There are some designs available elsewhere in this Wiki, PCBs in the BATC shop and advice on the BATC forum. It is also possible to use a standard satellite receiver or BATC Minitiouner to provide the DC supply and split out the signals using a power splitter. A number of LNBs are suitable for receiving amateur band transmissions and this page lists them. The octagon range of PLL LNBs were the first mass market LNBs to use a PLL rather than free running DRO for the Local oscillator. This made them suitable for receiving narrow band (SSB and CW) signals although they do suffer some temperature drift. The Farnham Web SDR used an unmodified Octagon LNB as the 10GHz receiver for a couple of years. CQ-TV 261 page 36 had an article by Dave G4FRE on locking the 27MHz Octagon. 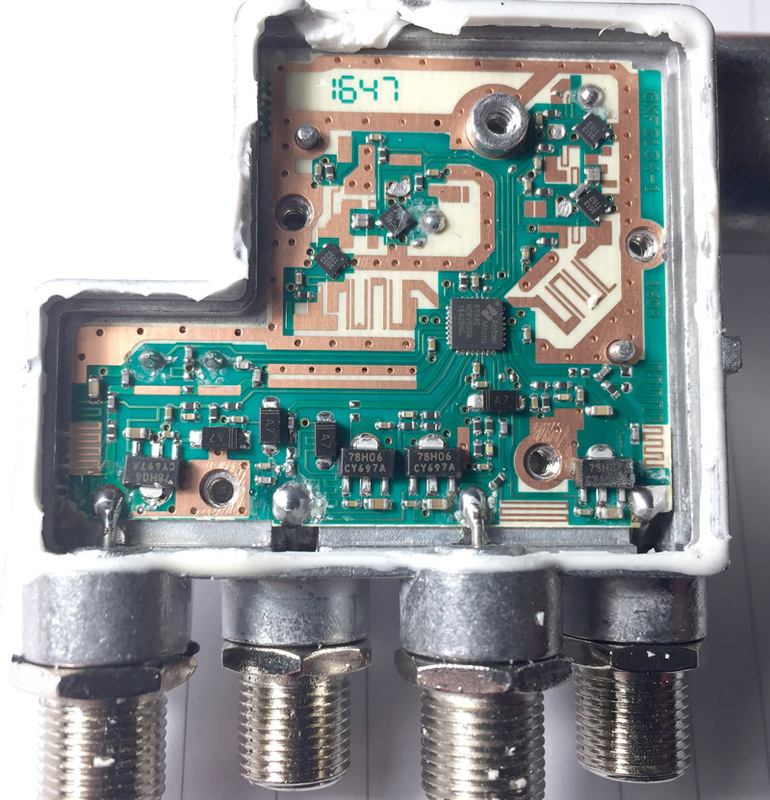 All LNBs are designed for use on the satellite band 10,700MHz to 12,750MHz and using them to receive either satellite or terrestrial amateur transmissions with a maximum frequency of 10,500MHz (in the UK) is outside their publish specification. I have measured a few of these. The earlier 27MHz dual version has about 1.2dB NF at 980MHz (bottom of tv satellite band) and at 618MHz (10368MHz), on both polarisations. Later ones are typically 1.5dB at 980MHz on either polarisation, and at 618MHz (10368MHz) about 1.5dB on the probe furthest from the backshort (V >15) and 2dB on the probe nearest the backshort (V <15v). The measurements are on unmodified LNBs. 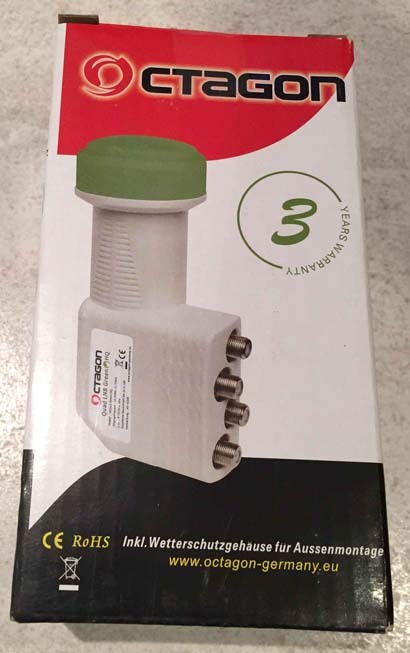 The Octagon "Quad LNB Green" Model OQSLG Green HQ can easily be modified to run from an external 25 MHz reference fed in on one of its F-type sockets, while still providing 3 horizontal or vertical outputs. This LNB is available (Jan 2019) from Amazon UK for under £15. The item title is "Octagon 0.1db Quad High Gain HD Ready Universal LNB", but check carefully that you get the OQSLG model. The modifications described below have been done on 2 LNBs by G8GKQ. The 25 MHz crystal is mounted on the reverse side of the board, just North of the West-most 78H06 regulator. The modification involves cutting the tracks leading to the West-most output and then coupling this to the East-most crystal connection, having cut the tracks to the crystal. Use a magnifying glass, a fine knife and a fine soldering iron, taking anti-static precautions. The track cuts can be seen here. The first is in the zig-zag inductor to cut the DC path from the socket. The second is in the RF path just South of the East-most crystal connection. The 3rd and 4th cuts are adjacent to the crystal connection. I then soldered a 10n capacitor across the old RF capacitors. 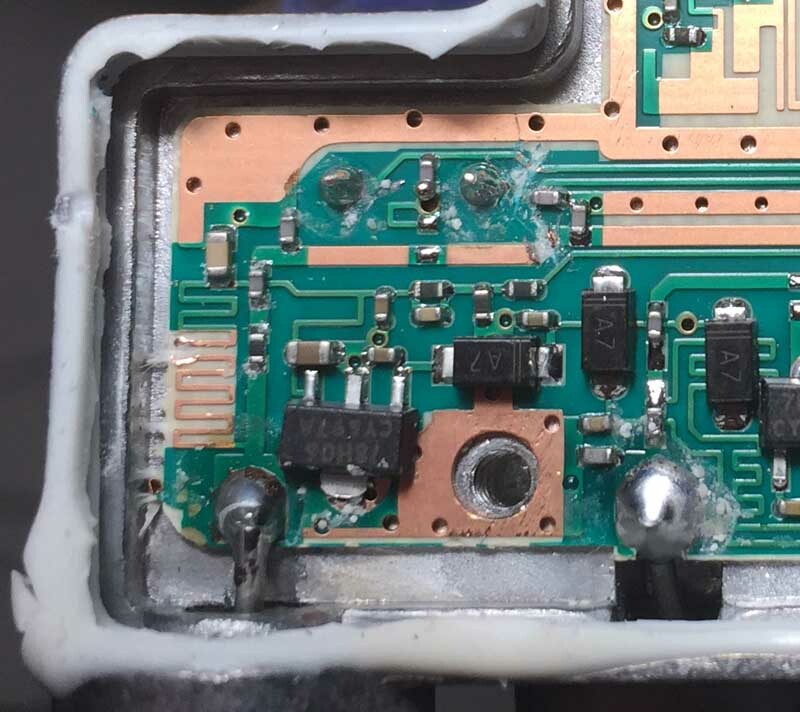 I put a 100 ohm chip resistor to ground at the middle of the East-West RF track, and then a 10n chip capacitor from the East end of the RF track to the track which used to connect to the crystal. The LNB should then be tested with a 25 MHz reference. Note that it will not now operate without a reference signal. If all is well, the cover can be replaced. Before putting the LNB on the dish, I sealed around the cover using a neutral cure silicone sealer. Screwfix 83710 is cheap and does the job. The modified LNB will run from a square wave or sine wave at 25 MHz, but needs around +6 dBm. Lower levels of reference increase the Phase noise. I used a Leo Bodnar GPS reference, with a low pass filter so that I fed a sine wave through the cable to the LNB. The low pass filter had 5 elements, 288 pf to ground on the input, a series inductor of about 10 turns on a 4 mm core, 407 pf to ground in the centre, then another identical series inductor and 288 pf on the output. A QRP-Labs 10m low pass filter kit for c. £4 may make a suitable alternative. While having a stable LO might be perfect for narrow-band operation, any increase in phase noise might reduce the apparent sensitivity for DATV. I found that a 1MS DVB-S signal that gave 24 dB MER with the crystal oscillator only gave 21 dB MER with the external reference; this will need more investigation.